Dental anesthesiologists, in addition to their hospital training, are specifically trained to provide anesthesia in an office setting. Dr. Sadeghi has provided anesthesia safely without any complications for thousands of pediatric and adult patients for the past 20 years. Anesthesia delivered by Dr. Sadeghi WITHOUT anesthetic inhalation gases is safer for dental procedures in an office setting than any other methods in which these gases are used. Anesthetic gases like Sevoflurane, Isoflurane, Desflurane, and Halothane can trigger a life-threatening emergency called Malignant Hyperthermia (MH). MH is one of the most difficult emergency conditions to diagnose and treat. MH treatment requires multiple trained staff and a standby laboratory to process blood tests for the purpose of diagnosis and treatment, along with a well-equipped hospital facility to coordinate treatment for different aspects of this potentially fatal condition. Unfortunately, a dental office is NOT properly equipped to manage and treat MH successfully. Dr. Sadeghi has eliminated all drugs that trigger MH from his practice. Open airway and secure airway techniques are used by anesthesiologists to provide anesthesia in dental offices. Dr. Sadeghi has used both techniques for over 20 years to provide safe anesthesia in a dental office setting. Open airway technique allows the anesthesiologist to provide a lighter level of anesthesia called deep sedation. With the open airway technique, the patient does not need to be fully intubated. Intubation (secure airway) is an invasive process that requires the anesthesiologist to insert a blade deep into the oral cavity and pharynx (Laryngoscopy) to facilitate an insertion of a tube into the trachea either through the nose or oral cavity. Since the invasive intubation process is not utilized in an open airway technique, the patient does not require a very deep level of anesthesia. The patient's airway is fully protected with a multilayer throat pack which prevents any foreign material to enter the throat. Anesthesia with the open airway technique is provided routinely by anesthesiologists for a majority of minor surgeries such as dental, eye, foot, hand, plastic and many diagnostic procedures like colonoscopy and MRI. Having used both secure and open airway techniques in the past, Dr. Sadeghi has come to the conclusion that open airway anesthesia is the safest and least invasive because it allows the anesthesiologist to keep the patient asleep and comfortable with the least amount of drugs. The open airway technique also prevents major complications that can occur as a result of using anesthetic gases and the intubation process. 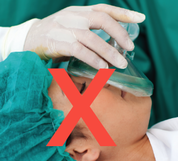 In fact, the new trend in anesthesia training programs is to avoid full-intubated general anesthesia, if possible, especially for fragile and medically compromised patients. Recovery from open airway anesthesia is a lot smoother than secure airway anesthesia in which the patient can suffer from post-op agitation, nausea, vomiting, throat soreness, nose bleed, pharyngeal tissue damage and swelling. Since dental patients are discharged shortly after termination of the procedure, it is imperative to use anesthesia techniques that minimize post-op complications. Dr. Sadeghi’s anesthesia delivery produces a very smooth recovery. Parents are pleased to observe their child being comfortable and relaxed with no post-op agitation, nausea, vomiting or any other complications during recovery period. All contents copyrighted by Dr. M.H. Sadeghi, D.D.S., 2018 © Dr. M.H. Sadeghi, All Rights Reserved.